Wearable fitness trackers have come a long way since Nike debuted the Fuel Band in 2012. The Fitbit Charge HR represents the current evolution of wearable fitness products. If you’re on a tight budget, focus first on the essentials (good running shoes ((Brooks Adrenaline Trail Shoe is Aces)), decent hiking back pack (GoRuck GR2), gym membership or at home gym equipment like a pull-up bar). But if you have all the basics, and are looking to get a bit more scientific about your workouts, the Fitbit Charge HR is a great product to add to your arsenal. Personally, I have been using the Fitbit Charge HR for over a year now and can personally attest to the benefits that it has brought to my training. With just the click of a button, you can quickly toggle through current time, total daily steps, current heart rate, total daily mileage, calories burned, and total floors climbed. And if you hold the button down twice, you can track specific workouts. Which will generate workout specific data (average heart rate, total distance, total time, etc.) I really like to use this feature for hiking, especially if I’m climbing in unfamiliar terrain. The Charge HR uses air pressure changes to assess elevation gain, and is fairly accurate. For each 10 feet of elevation gained, it calculates that as a floor climbed. So if it says you have climbed 100 floors during a workout, you ascended ~1,000 feet. There’s also a neat social component built into Fitbit’s product line. You can add friends and challenge them to daily or weekly step contests. Again, it’s a bit of a novelty, but during the off-season, when it’s so easy to just sit on the couch, drink beer and binge on Netflix, any little bit of motivation helps, and competition is a great motivator. Solid Analytics. An important tenet of the Hotshot Fitness Program is tracking your progress relative to your goals. The Charge HR helps with that. The dashboard can be accessed online and on your phone (android & iOS). The user interface is intuitive. Navigation is easy. Data is visualized in a way that is easily understandable. Good looks. Low Profile. It flies under the radar and doesn’t call attention to itself. It can be worn in an office, on a date, and at the gym. Great versatility. Heart rate tracking is surprisingly accurate. In my experience, this has been one of the most consistently dialed-in features. Fitbit Customer Service. After a year of using my Fitbit, the rubber wrist band began to separate on the corners where it connects with the watch face. After contacting the company about the issue, I was immediately shipped a refurbished Fitbit, same color, same model, free of charge. Minimal questions asked. My wife had a similar experience and she received the exact same customer service. Great customer service goes along way. 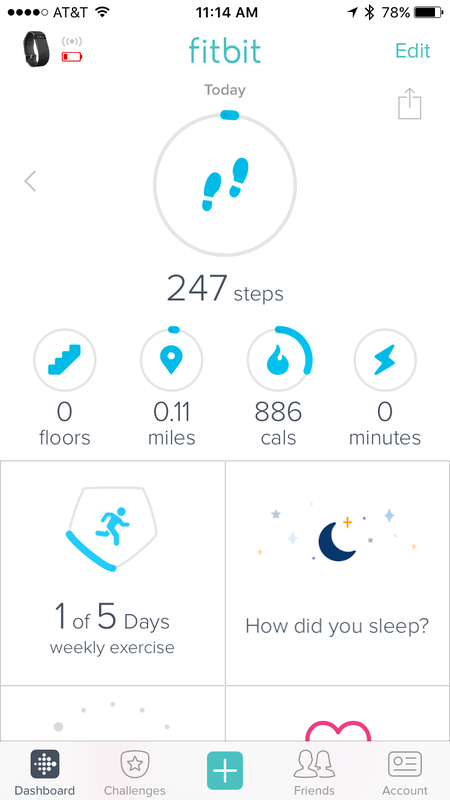 Syncs with other devices in the Fitbit universe like the Fitbit Aria Wifi Scale. Occasional Syncing issues. Though, over the last year, firmware updates have been made, and syncing has become much more reliable and faster. Mileage tracking. I feel that the Fitbit under-tracks my mileage. There’s a 4-mile out-and-back that I do regularly, and I KNOW it’s four miles. Google Maps says so. My car says so. But my Fitbit always records it as 2.98 or 2.99 miles. Which is a substantial delta. So I would not recommend you use the Fitbit for tracking distance, especially if using for back country navigation. Not completely waterproof. It will handle getting splashed (saying while you’re doing dishes or washing your hands) and can handle intense sweating no problem (can confirm, I sweat like a pig), but it can’t be submerged. There have been quite a few times when I hopped into the shower and then hopped right back out because I still had the Charge HR on my wrist. It would be nice to not have to worry about that. Display hard to read in direct sunlight. Especially during the middle of the day, when the sun is beating down, it is difficult to read the display. You’ll need to shade the display with your hand to read it. A minor issue, but it would be nice if future versions had brighter displays. If you’d like to see more reviews on this item before you purchase, I would recommend you to visit https://inkdly.com/. You will find multiple reviews and hopefully be able to make a more informed decision before purchasing this FitBit!